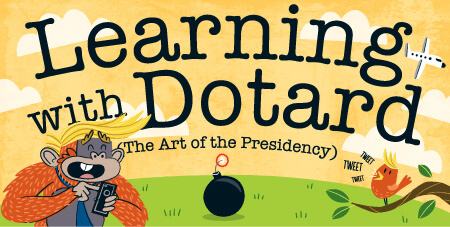 “Learning with Dotard (The Art of the Presidency)” is hilarious! Susan Thaemlitz and Craig Stuart have created the perfect stocking-stuffer for Christmas. Great illustrations by Dack Stevens shed light on the fumblings and bumbling of the orange-haired, short-fingered man currently sitting in the Oval Office. Well worth checking out! –Sebastian S.